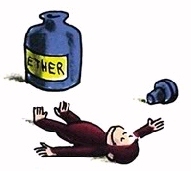 Okay, Curious George didn't really die from an overdose of ether. But after launching a blog reviewing children's picture books, I've discovered that some stories can be just as depressing! And you ask me where's my sense of humor?" This book was written by a 22-year-old diagnosed with Hodgkin's disease, who died just before it was published. Eventually the jester brings a smile to a little girl's face — and then, to the entire city, as the unusual plot of author David Saltzman lurches to a happy ending. Six months later, Saltzman was dead. Fluffy bunnies? Happy little puppies? Nope. 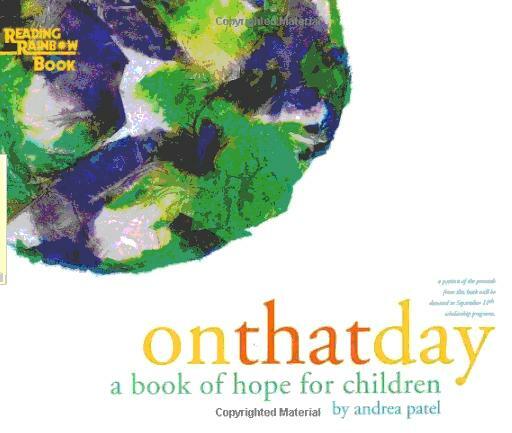 This children's picture book culminates with the terrorist attacks on the World Trade Center. Maira Kalman emphasizes that on 9/11, two airplanes "CRASHED, CRASHED, CRASHED into these two strong buildings...." It's illustrated with a two-page watercolor showing a cloud of debris plummeting from the top of the tower, to help young readers visualize the impending carnage. Turn the page, and another two-page watercolor shows flames sweeping uncontrollably through the buildings at ground zero. And then there's another two-page spread, showing exactly what that same fire looked like that night. They're not quite the cheery images you'd want to savor before bedtime. It's the climax of a story about the history of New York's famous fireboat, the John J. Harvey, which sprayed water on the burning towers all night with a volunteer crew. Which is why the book is called "Fireboat" — and why parents received no warning whatsoever that the book closes with the World Trade Center attacks until it surprises them in the book's final pages. "Thanks for making me cry my head off in front of my child!!" wrote one reviewer on Amazon. "Unfortunately, Curious George's parents were both dead, since they'd already been shot in the head by local hunters." That's basically the story Jane Goodall tells in Rickie and Henrie. Though she uses a real monkey instead of Curious George. 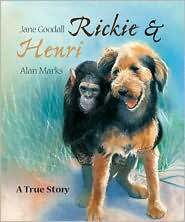 Based on a true story, Goodall's picture book describes a mother monkey who tenderly holds her little baby — a female monkey named Rickie. Rickie's mother carried her from place to place, and "comforted her when she was hurting or frightened." But in the next picture, Rickie is shown screaming beside her mother's dead body, as a man with a gun walks away. "The hunter seized Rickie and pushed her into a tiny basket, while the infant chimpanzee, who didn't understand, went on screaming and screaming for her mother." (Who does nothing, because she's already dead.) In the next illustration, the scared little monkey is locked in a cage on a pole, and she's already been wounded by shotgun pellets. But "however much she cried, there was no one to help." "We were separated from our families and put into a camp," she says, remembering her experience as a 12-year-old girl in the Nazi death camps. Working in a kitchen guarded by an intimidating Nazi soldier (standing with a German shepherd guard dog), she'd shared the barracks with her 13-year-old sister. 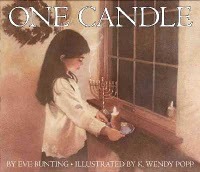 And most of the book is told as a horrified flashback, as the girl remembers trying to smuggle a potato past the guard for a Hanukkah celebration. The book explains the death camps as simply as possible. ("The Germans didn't like the Jews...") But another relative at the present-day Hanukkah celebration counters with a more nuanced perspective. "The Germans didn't like a lot of people. It wasn't only the Jews." "Fireboat" may have covered the World Trade Center attacks, but at least it wasn't done with a tissue paper collage. Because ironically, that had already been done by Andrea Patel, a Massachusetts schoolteacher — and pastry chef, and musician. She represents the earth as a big blue circle of tissue paper, then writes "One day a terrible thing happened," as a big red splotch appears on that circle. "The world, which had been blue and green and bright and very big and really round and pretty peaceful, got badly hurt. "Many people were injured. Many other people died. And everyone was sad." The book was finished within weeks of the September 11 attacks, and Patel donated all the book's proceeds to a 9/11 charity, but the whole exercise is still a little disturbing. People fumbled for the right response to the terrorist attacks, and in the end, this is probably Patel's most inadvertently honest sentence. "This is scary, and hard to understand, even for grown-ups." It's the Los Angeles riots — through the eyes of a child. What could possibly be more magical? "It can happen when people get angry..." a boy's mother says. "After a while it's like a game." The boy sees fires, and watches two men stealing a TV from an appliance store. Then another window breaks at a shoe store, and two men and a woman climb in through the broken glass. That night his own apartment building is set on fire, and the boy and his mother have to flee to a shelter for safety. 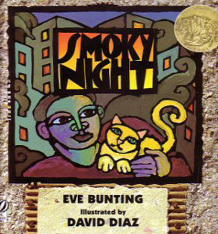 Author Eve Bunting actually lives in Los Angeles (and her illustrator lived just an hour away). Which is why one of her next fun-filled stories was about poor day laborers fighting for work in a Los Angeles parking lot. "What makes me most sad is when I think about my son Eddie. "I loved him very, very much but he died anyway." That's Michael Rosen, a British broadcaster, and his son died of meningitis in 2004 at the age of 19. "Sometimes this makes me really angry," Rosen writes in his book. (Its title? Michael Rosen's Sad Book.) "Maybe you think I'm happy in this picture. Really I'm sad but pretending I'm happy." Rosen was 56 when the tragedy struck, and he's startlingly open about the experience of coping with a loss. Why is he smiling and pretending to be happy? "I'm doing that because I think people won't like me if I look sad." It's a depressing read, but it's also a brave moment of personal honesty. And maybe he's also sending us a message about depressing children's books. Blossom Dearie's Conjunction Junction Romance? You forgot Love You Forever, by Robert Munsch (http://www.amazon.ca/Love-You-Forever-Robert-Munsch/dp/0920668372). As beautiful as it is, I don’t think that I’ve ever read it without getting choked up. I’m amazed that in this list of the most depressing children’s books ever written you have two about 9/11 and not a *single* one of Hans Christian Andersen’s stories. I think a list like this can’t be complete without the inclusion of Shel Silverstein’s “The Giving Tree”. Such a depressing story of one child taking advantage of the codependent nature of a lonely tree that is willing to be used and used again just for the company of another living being. Respectfully, I’d submit that if you think only fun-filled books are child-appropriate–if you think books that address issues that kids wonder about or deserve to know about can only be filled with rainbow-horned unicorns that poop almond M&Ms–I don’t know what to think of you. And, *duh*, anyone who reads a book as _bedtime reading_ to a kid with those same expectations, without reading it privately *first*, is asking for trouble. I’m buying a copy of FIREBOAT! because I want kids to know they can be heroes even when terrible, terrible things happen. Even when things “CRASH, CRASH, CRASH into… two strong buildings….”. And I want to foster the availability, as appropriate to individual kids, of that message. Sorry if that concept freaks you out. Fortunately, it’s a big ol’ world. Cheerio. Wow, that’s some bedtime stories! I think I’d actually like to read #7, though, but not to a child. Of course horrible things happen all the time and you can’t always shield your children from them, but I wouldn’t exactly go out of my way to teach that to them any sooner than necessary. Plenty of time to get disillusioned with the world later on. Also “Not Now, Bernard!”, in which children learn that if you try to tell your parents about something bad, they’ll ignore you because they have no time for you, and won’t notice if you ARE EATEN AND REPLACED BY A MONSTER. Anyone else ever read the original book version of Bambi by Felix Salten? Bambi’s mother is not even the HALF of it. All those cute, fuzzy forest creatures Bambi likes to frolic with in the movie? They all die. In (for a kids’ book) extremely graphic and traumatizing ways. I do think it’s a great book, and I recommend reading it – but not to your kids. I don’t know if this is good or bad , but our daughter is 2 and enjoys books like The Very Hungry Caterpillar and The Going-To-Bed Book to be read by my wife.With me it is ABC and 123 coloring books and anything to do with animals . The only bad experiance we had was WIZARD OF OZ . The book was given to her by my parents and obviously scared her . She tore it up in pieces and put in our Germen Sheperds food bowl !! Lesson learned , my wife and I review books alot closer now and are on the same page about what are daughter reads . The world was “pretty peaceful”? What world was Patel living in? That’s almost an example of an overly sentimental worldview for kids, not a depressing one. I was a very sensitive and timid child myself, and thus I’m all for introducing kids to the world’s problems in careful, realistic, and age-appropriate ways, but let’s be honest here. Millennia of wars, famines, natural disasters, etc., do not a peaceful world make. Fireboat is my favorite. I recommend this book to parents everywhere. Those are some depressing children’s books. Some of the bedtime songs are bad too – sing Rock a Bye Baby and think about the words. Egads! The cradle will fall – down will come baby – cradle and all! i agree with you that some kids stories can be depressing, these stories draw the earlier imagination of kids we shouldn’t plant such terrifying ideas into their mind we need to make them optimistic beside warn them with w a proper way which suits theier mind . What about “The 3 Lives Of Thomasina” where the father who happened to be the LOCAL VETERINARIAN of a young girl deemed her cat to be a “hopeless case” and arbitrarily decides to PUT THE CAT DOWN and in the end the cat was saved by some sort of “alternative healer”…………………………………………. As for the “Thomasina” story, what a way to get kids to trust vets with their family cat or dog. About the decision to starve trained Japanese zoo elephants rather than risk them running loose in the event of a bombing.